You can use a Notification Lookup profile to send an email to addresses that are stored in a lookup table. The lookup table might contain submission data from an older form, for example. Using the rules feature, you can filter the records that are returned from the lookup table. You can also update the submission data for the form with values that are returned from the lookup table. For example, you could copy the first and last name from the lookup table to similar fields in the submission table for the form that is being submitted. 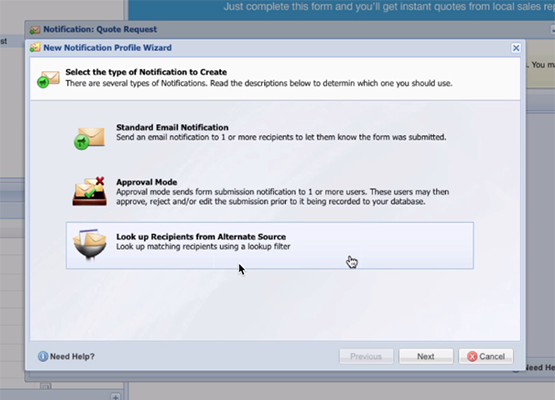 The Lookup Settings panel of the Wizard lets you configure the message you want to send at each form submission. You specify a From Address and From Name, a Subject and, optionally, you can attach a PDF file to the message. You can also send a message (to the same or to a different email address) if no records are returned from the lookup table. It's important to note that you can create several other notification profile types, including Standard Notifications, Dynamic Approval Mode, or User Approval. You can create multiple notification profiles, and then configure one or more rules to determine which notification will run in a given situation. On the Select the type of Notification to Create panel, choose Look up Recipients from Alternate Source, then click the Next button. Enter a Notification Profile Name for the profile. If you want this profile to be the default profile for your form, select the Default Profile check box. Click the Next button to continue. The Lookup Settings panel displays. If you want to include content from the form in the From Address, From Name, or Subject line, click the Wildcard button next to the appropriate field and select the desired element. If there are PDF files associated with the form and you wish to include one or more files with the notification, select the check box for each file you wish to include from the PDF Attachment menu. In the Lookup Source & Additional Settings section, select the Lookup Table and Lookup Field that you want to examine. NOTE: For this notification profile to work properly, the values in the Lookup Field must contain email addresses. The Lookup Table menu lists all forms associated with your user account. The Lookup Field menu lists all form elements for the selected Lookup Table. Select the field that contains the recipients’ email address. You can send a message to a specified email address in cases where no records are returned from the Lookup Table. Enter the Failure Email address to which you want a Failure Message sent when no records are returned from the Lookup Table. Click the Edit Message button to create the body of the message. Click the Launch Email Editor button to launch the Rich Text Editor and create the message that will be sent to the recipients returned from the Lookup Table. You can use the Wildcard button to insert field placeholders into the message. For example, you might create a greeting that begins with "Dear [Salutation] [First Name] [Last Name]..."
Click the Update Field Values button to display the Update Fields with Lookup Query Results window. Choose a Lookup Table Field containing the value that you want to transfer into the current form, then choose the corresponding Update Field. Repeat as necessary to define additional fields for update. Click the Save button when all fields for update have been defined. The Lookup Filter panel displays. Click the Edit Lookup Filter button and use the standard Logiforms rule screen to configure the rule that will control which records return from the lookup table. For example, you might want only those records where the country is "Canada," or when a submission date is earlier than a specific value.